The following article by Helen Yaffe was sourced from the Marxist Internet Archive. Reposting here is for critical discussion and does not imply endorsement or affiliation. In January 1962 Guevara told colleagues in Cuba’s Ministry of Industries (MININD): ‘In no way am I saying that financial autonomy of the enterprise with moral incentives, as it is established in the socialist countries, is a formula which will impede progress to socialism’. He was referring to the economic management system applied in the Soviet bloc, known in Cuba as the Auto-Financing System (AFS). By 1966, in his critique of the Soviet Manual of Political Economy, he concluded that the USSR: ‘is returning to capitalism.' This paper will demonstrate that Guevara’s analysis developed in the period between these two statements as a result of three lines of enquiry: the study of Marx’s analysis of the capitalist system, engagement in socialist political economy debates and recourse to the technological advances of capitalist corporations. At the same time Guevara was engaged in the practical experience of developing the Budgetary Finance System (BFS); an alternative apparatus for economic management in MININD. Guevara was head of the Department of Industrialisation and President of the National Bank in 1960 when all financial institutions and 84% of industry in Cuba were nationalised. His BFS emerged as a practical solution to problems thrown up by the transition from private to state ownership of industrial production. Cuba had an unbalanced, trade dependent economy dominated by foreign interests, principally from the United States. The production units which passed under the Department’s jurisdiction ranged from artisan workshops to sophisticated energy plants. Many faced bankruptcy while others were highly profitable. Guevara’s solution was twofold: first, to group entities of similar lines of production into centralised administrative bodies called Consolidated Enterprises. This allowed the Department to control the allocation of scarce administrative and technical personnel following the exodus of 65-75% of managers, technicians and engineers after 1959; and second, to centralise the finances of all production units into one bank account for the payment of salaries, to control investment and sustain production in essential industries which lacked financial resources. With the establishment of MININD in February 1961, the BFS evolved into a comprehensive apparatus which embedded these organisational structures in a Marxist theoretical framework, to foster Cuba’s industrialisation, increase productivity and institutionalise collective management. With the imposition of the US blockade, Cuba was forced to buy factories from the socialist countries, especially the USSR. This assistance was essential, but the relative backwardness of the equipment clashed with Guevara’s desire for advanced technology transfers. He did not criticise the Soviets for this backwardness per se. Rather, he complained about the contradiction between the high level of research and development in military technology and low investment applied to civilian production. He objected to their ideological resistance to appropriating advances made in the capitalist world. This was a costly mistake in terms of development and international competitiveness. For example: ‘For a long time cybernetics was considered a reactionary science or pseudo-science… [but] it is a branch of science that exists and should be used’. He added that in the US the application of cybernetics in industry had resulted in automation – an important productive development. Basing a management system for socialist transition on capitalist technology was consistent with Marx’s stages theory of history, which predicted that communism would emerge from the fully developed capitalist mode of production. Marx showed how the tendency to concentration of capital, that is, to monopoly, was inherent in the system. Therefore, the monopoly form of capitalism was more advanced than ‘perfect competition’. The Soviet system originated from predominantly underdeveloped, pre-monopoly capitalism. A socialist economic management system emerging from monopoly capitalism could be more advanced, efficient and productive. The origin of the BFS was the multinational corporations of pre-1959 Cuba and it was therefore more progressive than the AFS which was adapted from pre-monopoly Russian capitalism. While Guevara argued for the adoption of advanced technology he opposed the use of capitalist mechanisms to determine production and consumption. He challenged the Soviet’s reliance on capitalist categories to organise the socialist economy, particularly the operation of the law of value. The dispute about the law of value in transition economies is central to the question about the feasibility of constructing socialism in a country without a fully developed capitalist mode of production. It is integral to problems of accumulation, production, distribution and social relations. Communism implies a highly productive society in which conditions exist for distribution of the social product based on need, not surplus-generating labour time. However, the countries which have experimented with socialism have been underdeveloped, lacking the productive base for the material abundance implied by communism. The Soviet solution was to rely on the operation of the law of value to hasten the development of the productive forces, applying the profit motive, interest, credit, individual material incentives and elements of competition to promote efficiency and innovations. Guevara argued that these were not the only levers for fostering development. The BFS was the expression of his search for an apparatus to increase productive capacity and labour productivity without relying on capitalist mechanisms which undermine the formation of new consciousness and social relations integral to communism. Between 1963 and 1965 these questions were examined in Cuba during the Great Debate on socialist transition. To the extent that commodity production and exchange through a market mechanism continued to exist after the Revolution in Cuba, it was clear to all participants in the Great Debate that the law of value continued to operate. The social product continued to be distributed on the basis of work done. However, the disagreements were about the conditions explaining the law’s survival, its sphere of operation, the extent to which it regulated production, how it related to the ‘plan’ and whether the law of value should be utilised or undermined, and if so, how. This discussion was linked to practical questions such as how enterprises should be organised, how workers should be paid and whether goods should be exchanged between state enterprises as commodities. Guevara agreed that the law of value remained under socialism but argued that measures taken by the Revolution to undermine the capitalist market meant that the law could not serve as the dynamic catalyst to productivity and efficiency in the same way as it did under capitalism. Socialisation of the means of production and distribution had ‘blunted’ the tools of capitalism. Marx described a commodity as a good which changes ownership, from the producer to the consumer. Consistent with this definition, Guevara insisted that products transferred between state-owned enterprises did not constitute commodities because when they were transferred from one state factory to another there was no change in ownership. The state itself should be considered as one big enterprise. For Guevara commodity-exchange relations between factories threatened transition, via ‘market socialism’, to capitalism. He stressed central planning and state regulation as substitutes to such mechanisms. For Guevara the task was not to use the law of value nor even hold it in check, but to define its sphere of operation and make inroads to undermine it – to work towards its abolition, not limitation. He developed many policies within the BFS to attempt just that. In February 1964, Guevara concluded: ‘We deny the possibility of consciously using the law of value, basing our argument on the absence of a free market that automatically expresses the contradiction between producers and consumers… The law of value and planning are two terms linked by a contradiction and its resolution.' For Guevara, centralised planning was the fundamental characteristic of socialist society. He conceded only: ‘the possibility of using elements of this law [of value] for comparative purposes (cost, “profit” expressed in monetary terms)’. The protagonists in Cuba were well-informed about the broader debate on incentives and financial autonomy contemporaneously underway in the eastern European socialist countries – a response to the problems of economic stagnation, low productivity and efficiency, particularly in comparison with economic growth in the developed capitalist world. In July 1964 Guevara told colleagues that he had been reading analyses from the socialist bloc, including the resolutions of the 14th Congress of the Polish Communist Party: ‘The solution that they are proposing for these problems in Poland is the complete freedom of the law of value; that is to say, a return to capitalism.' Commenting on the push to ‘liberalise’ the socialist economies Guevara said: ‘The theory is failing because they have forgotten Marx’. Instead of Capital, the Soviet Manual of Political Economy had been turned into a bible. Marx characterised the psychological or philosophical manifestation of capitalist social-relations as alienation and antagonism; the result of the commodification of labour and the operation of the law of value. For Guevara, the challenge was to replace the individuals’ alienation from the productive process, and the antagonism generated by class relations, with integration and solidarity, developing a collective attitude to production and the concept of work as a social duty. Capitalist competition created the drive to increase productivity through technological innovations and increasing exploitation. Alienation and antagonism increase with productivity. Under socialism, the development of the productive forces could be less accelerated, but it should be accompanied by a growth of consciousness. For Guevara, efforts to change consciousness must be incorporated into socialist transition at the earliest stage. Guevara criticised the Manual’s mechanistic adaptation of classical Marxist conceptions of class relations between the bourgeoisie and the working class, without considering the effects of imperialism which created a privileged working class in the advanced capitalist countries as well as beneficiary sectors in the exploited nations. He denounced as opportunism the Manual’s attempts to air-brush the inherent violence of class struggle integral to the transition from capitalism to socialism. Turning to the period of transition, Guevara argued that the USSR’s Kolkhoz collective farm system was not a characteristic of socialism and that cooperatives were not a socialist form of ownership – they generated a capitalistic superstructure which clashed with state ownership and socialist social relations imposing their own logic over society. Guevara systematically refuted the so-called laws of socialism cited by the Manual, particularly the law of constant rising worker productivity – which he called an outrage: ‘It is the tendency that has driven capitalism for centuries.' He condemned as ‘dangerous’ the Soviet’s policy of peaceful co-existence and economic emulation with the advanced capitalist countries and pointed to serious disagreements between the socialist countries, blaming them on unequal exchange and the imposition of capitalist categories in trade relations. While declaring his daring, respect, admiration and revolutionary motives, Guevara announced that Lenin was the ultimate culprit because the New Economic Policy (NEP) which he had been forced to introduce in 1921 imposed a capitalist superstructure on the USSR. The NEP was not installed against small commodity production, Guevara stated, but at the demand of it. Small commodity production holds the seeds of capitalist development. He was certain that Lenin would have reversed the NEP had he lived longer. However, Lenin’s followers: ‘did not see the danger and it remained as the great Trojan horse of socialism, direct material interest as an economic lever.' This capitalist superstructure became entrenched, influencing the relations of production and creating a hybrid system of socialism with capitalist elements that inevitably provoked conflicts and contradictions which were increasingly resolved in favour of the superstructure – capitalism was returning to the Soviet bloc. Guevara’s notes offer a profound criticism of Soviet political economy. He himself warned that some would misinterpret his proposed work as rabid anti-communism disguised as theoretical argument, but asserted that the inability of bourgeois economics to criticise itself, pointed out by Marx at the beginning of Capital, was seen in contemporary Marxism. He dedicated his work to Cuban students who go through the painful process of learning ‘eternal truths’ in eastern European manuals. He concluded that: Humanity faces many shocks before final liberation, but we cannot arrive there without a radical change in the strategy of the first most important socialist powers. 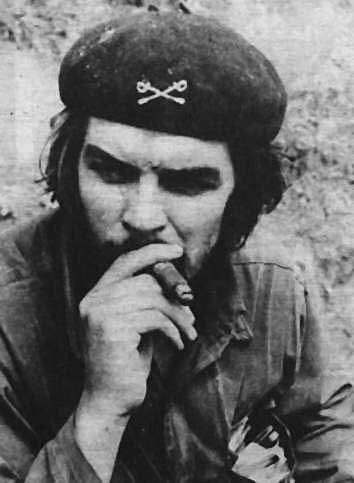 Ernesto ‘Che’ Guevara, ‘Reunion Bimestrales’, 20 January 1962, in El Che en la Revolución Cubana: Ministerio de Industrias, tomo VI. La Habana: Ministerio de Azúcar, 1966, 147. Guevara, ‘On the Concept of Value’ in Bertram Silverman (ed) Man and Socialism in Cuba: The Great Debate, New York: Atheneum, 234. Guevara, ‘Socialism and Man in Cuba’ in Silverman (ed) Socialism, 342. Guevara, ‘On the Budgetary Finance System’, in Socialism, 143. Guevara, Budgetary, 42. Guevara’s italics. Guevara, ‘The Meaning of Socialist Planning’ in Socialism, 109.